Gain City is a well-known brand name in Singapore which has established itself as the go-to retailer for consumer electronics. However, a few of their outlets are situated at isolated locations which are neither near shopping centres nor MRTs – leading to a less than desired number of walk-in customers despite its positive reputation. They needed to formulate a strategy that would drive footfall to these outlets without solely relying on launching huge discounted deals. Our SPH team developed a strategy to attract more customers to visit the remote Ang Mo Kio outlet – by introducing target home sampling. It was established that home is the best place to reach decision makers as it is where they have the most leisure time on hand. In order to tap on this, our team proposed to go one step further – deliver papers right to the doorsteps of those who live within close proximity to the Gain City Ang Mo Kio outlet. It is believed that residents are more likely to check out promotions and events if they take place near their homes. Furthermore, papers delivered directly to homes tend to have a longer shelf life, which would mean an increase in the total eyeball time. 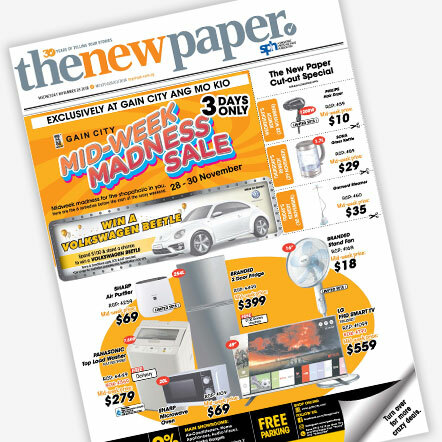 The team worked with The New Paper to provide extensive coverage of the special deals at the Gain City outlet in Ang Mo Kio to draw in the crowd. 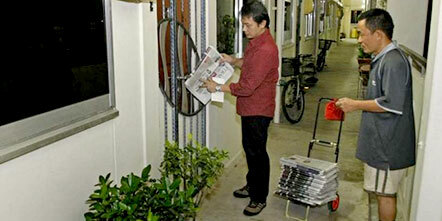 A total of approximately 30 000 copies of The New Paper were delivered to homes near the Ang Mo Kio outlet. Gain City was so satisfied with the results of the November campaign that they agreed to commit to another 2 runs in January for their other outlets following the successful November campaign.